For eleven years Rachel Devenish Ford has been writing about her not quite normal life at her blog, Journey Mama, telling stories about her days with characteristic honesty and humor. 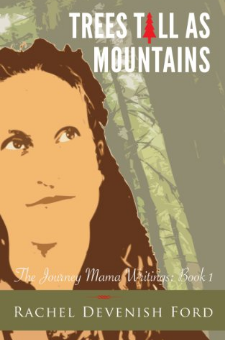 Now for the first time, this writing is captured in book format in the Journey Mama Writings Series. In Trees Tall as Mountains, Rachel writes about her life of volunteering in an intentional community in the woods of Northern California with her Superstar Husband and three young children, cultivating joy and her faith in God despite a continuing fight with anxiety and very simple means. She is candid and hopeful, intimate and humorous. Because Rachel’s explorations of faith are not trite or churchy, her writing is beloved by believer and non-believer alike. Her bright, honest words make strangers into friends, and Rachel’s attempts to truly understand the love of God radiate hope to others who are searching for him in the sometimes dark, sometimes beautiful world.